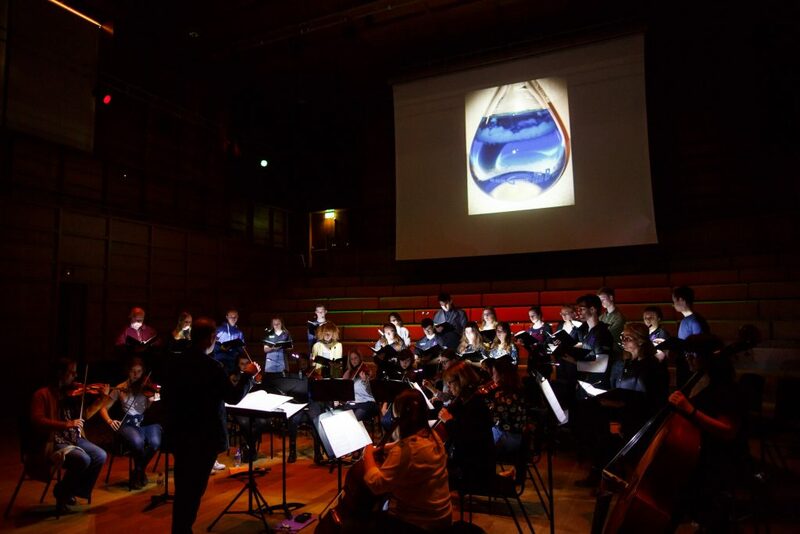 The University Cecilian Choir recently performed Ola Gjeilo’s colourful Sunrise Mass as part of the continuing Cellular Dynamics project, an initiative between the Music department and the School of Biosciences bringing together live music and cutting-edge research images. 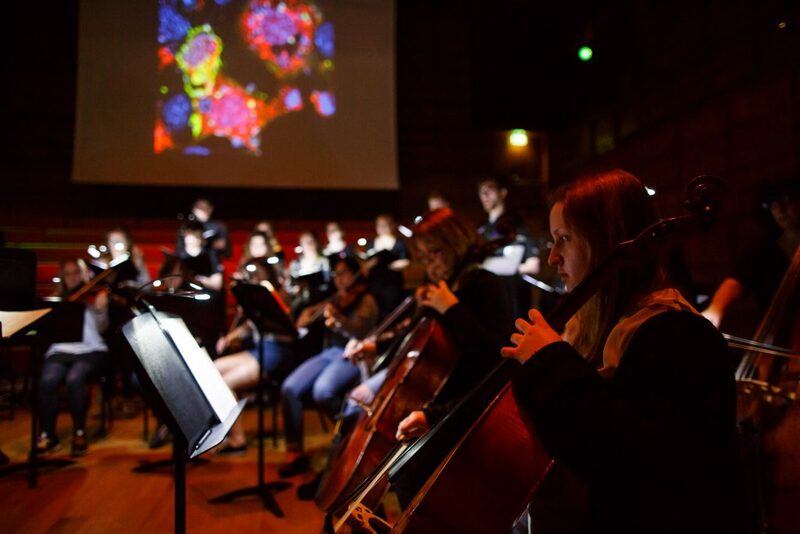 Gjeilo’s orchestral mass setting is a perfect foil for the array of images and media culled from the School of Bioscience’s research portfolio, which unfolded live on the screen over the heads of the performers, managed by Reader in Pharmacology and Deputy Head of School, Dr Dan Lloyd. 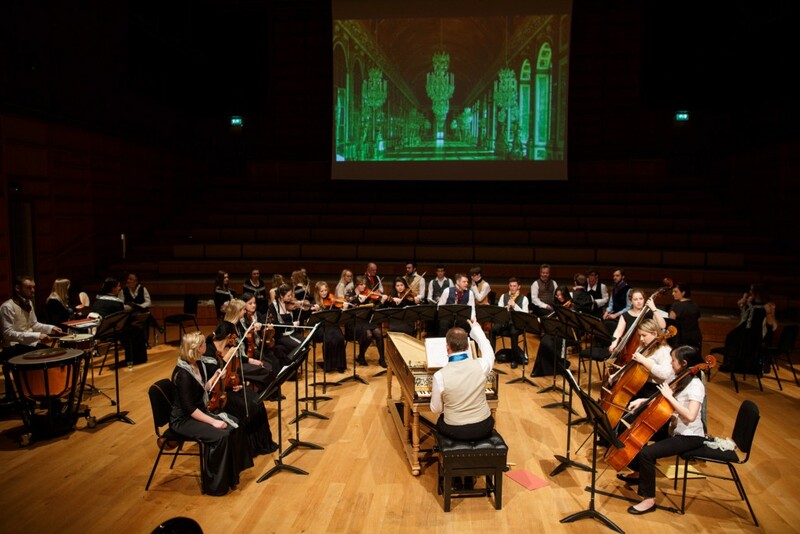 Amidst a hushed darkness, the music and projections combined to create a marvellously meditative atmosphere, which held the audience enthralled throughout the performance. 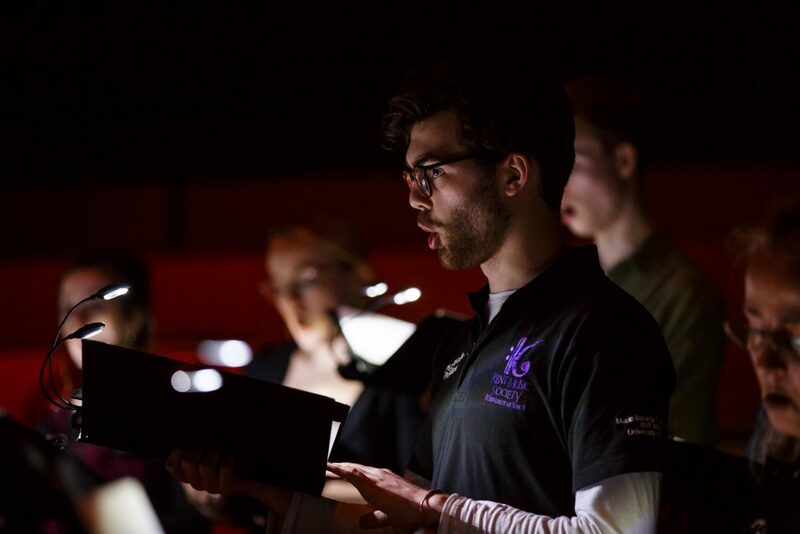 The Cecilian Choir comprises staff, students and alumni at the University, and the performance, together with the String Sinfonia, was conducted by Deputy Director of Music, Dan Harding. 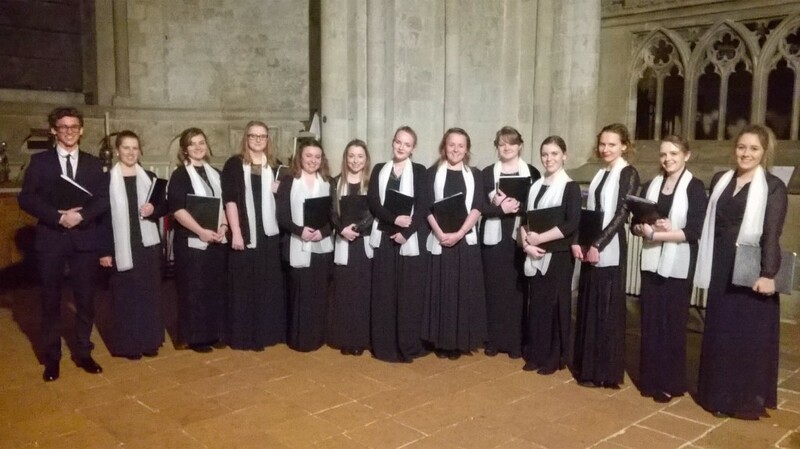 The Choir and Sinfonia will perform the Sunrise Mass again on Friday 8 June at St Mary of Charity, Faversham, as part of Summer Music Week. 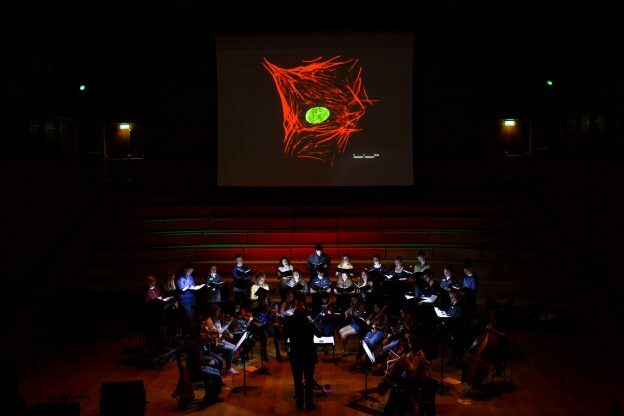 This entry was posted in Concerted effort, Sound thinking and tagged Cecilian Choir, Cellular Dynamics, Ola Gjeilo, Sunrise Mass on April 17, 2018 by Daniel Harding. 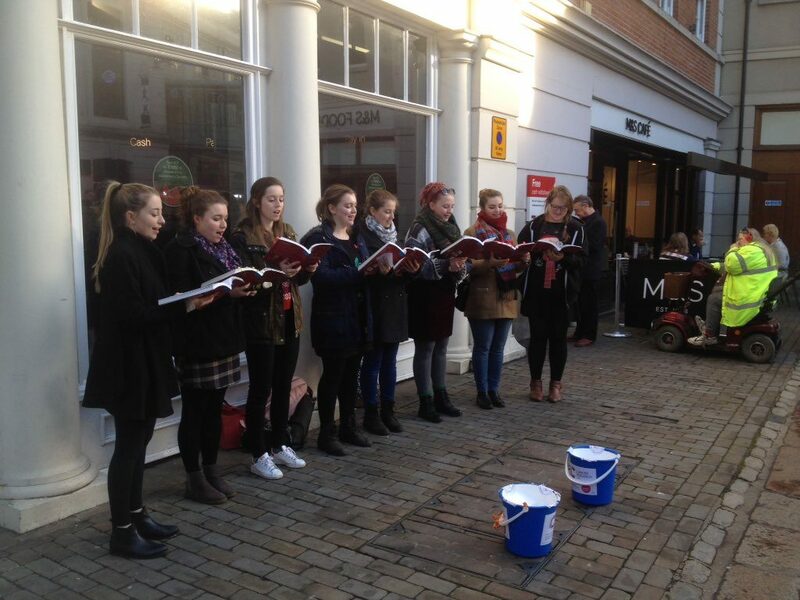 A bustling Canterbury high street was treated to a festive selection of carols for upper-voices, as Minerva Voices took to the street to sing in support of Cancer Research. 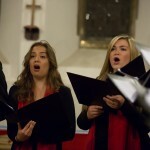 The idea was suggested by Inger Kviseth, a member of the Choir who works part-time for the charity, and asked if we would help with their fund-raising; the team leapt to respond, and were busy singing yesterday afternoon, aided by Music Society secretary, Robert Loveless, who wielded one of the collection buckets. 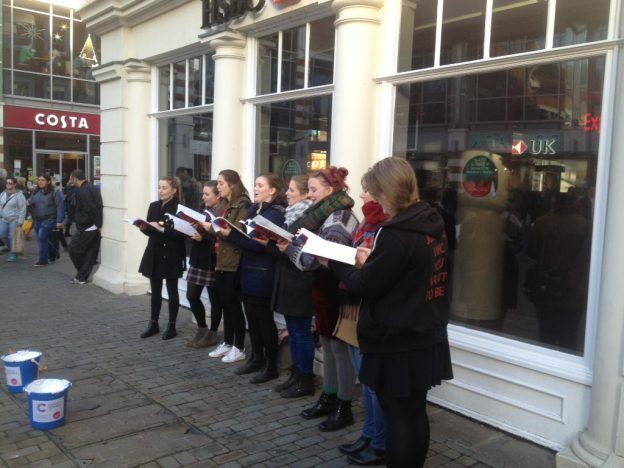 The shoppers responded with enthusiasm to the choir’s bringing Carols for Choirs to life, and a brisk chill in the air was met with a warm response from passers-by. Thanks to all the ladies – and to Robert! 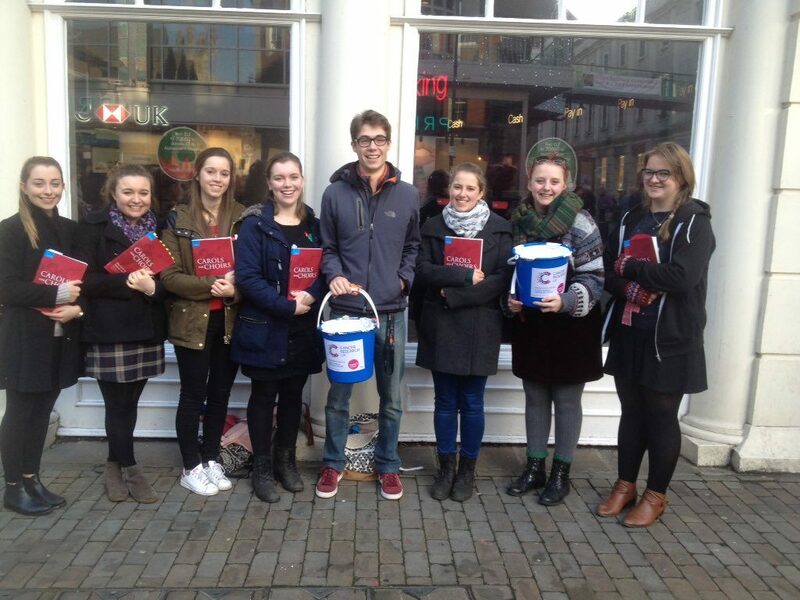 – for giving up their Sunday lunchtime in support of Cancer Research. 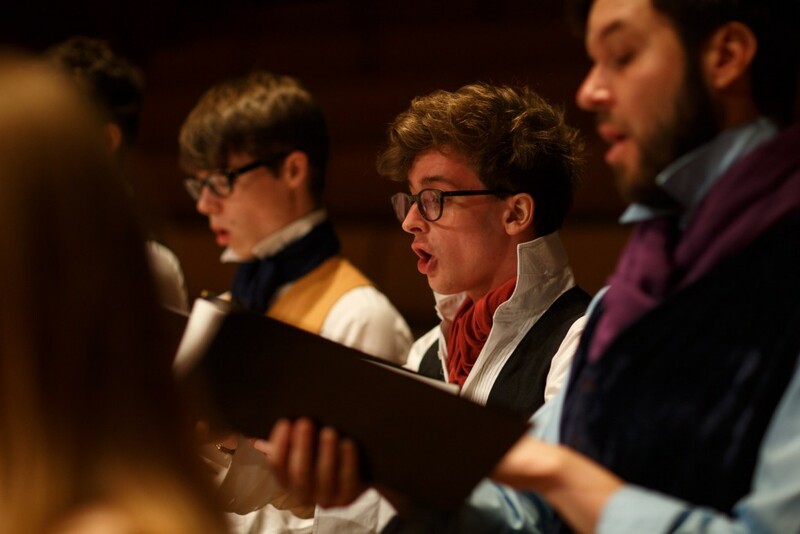 The Choir will be back in action this Wednesday in a very different guise, singing as The Minervettes with the twelve-piece vintage swing band, General Harding’s Tomfoolery, on the foyer-stage at lunchtime; admission is free, bring your dancing-shoes! 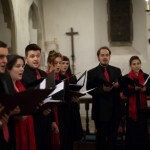 This entry was posted in Concerted effort and tagged Cancer Research, carols, Carols for Choirs, Minerva Voices on December 12, 2016 by Daniel Harding. 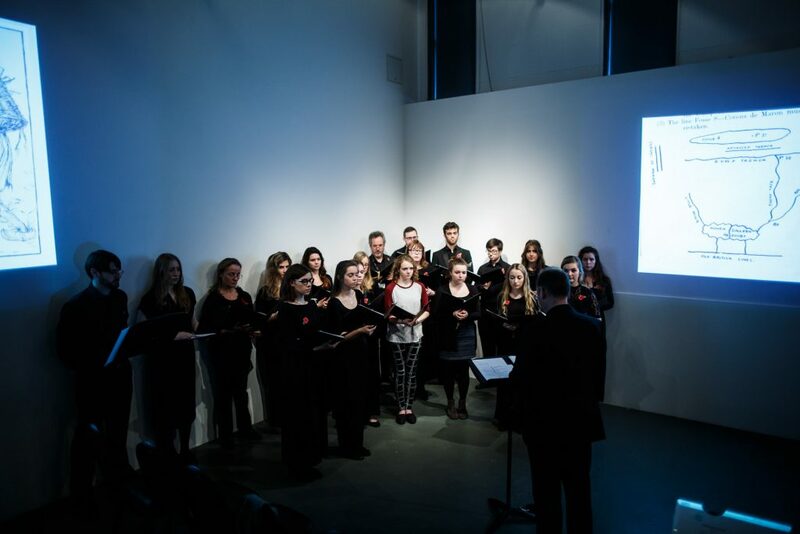 Pictures from last month, when the Cecilian Choir gave a performance of David Lang’s Memorial Ground, bringing together music, poetry and image projection, in Studio 3 Gallery. 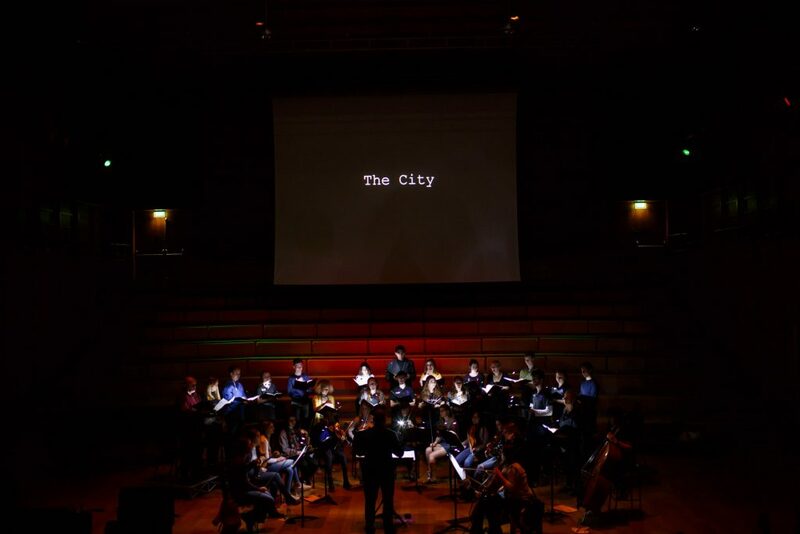 With thanks to Matt Wilson for the images. 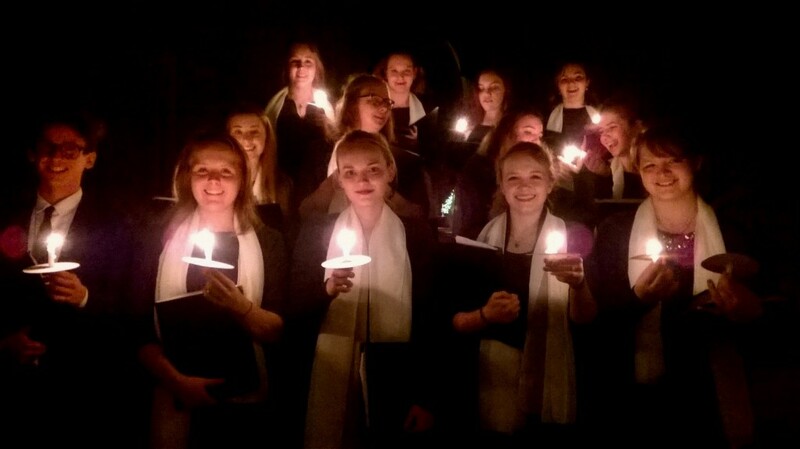 This entry was posted in Concerted effort and tagged Cecilian Choir, Memorial Ground on December 8, 2016 by Daniel Harding. 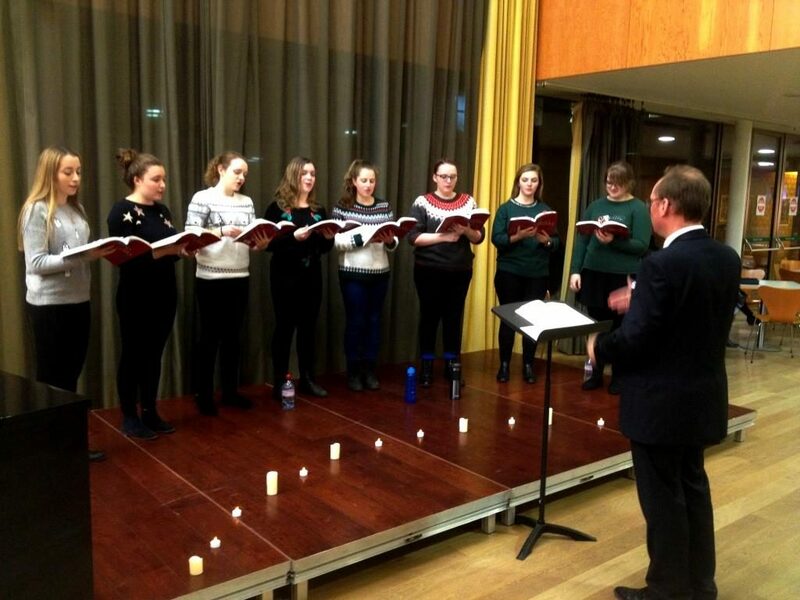 Minerva Voices, the upper-voices chamber choir, was in festive mood on Friday night, taking to the foyer-stage to add some seasonal musical lustre to the reception for University donors. 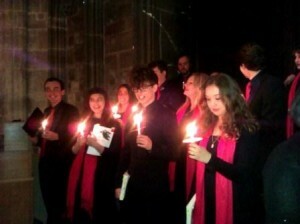 The foyer-stage was strewn with flickering candles (and for the sake of everyone wondering about a predominantly wood-paneled building and flickering flames, I should reassure you that they were electrical candles…) and festive jumpers as members of Minerva filled the foyer with favourites from the fourth edition of Carols for Choirs, an incarnation of the enduringly-popular publication in arrangements for upper voices. 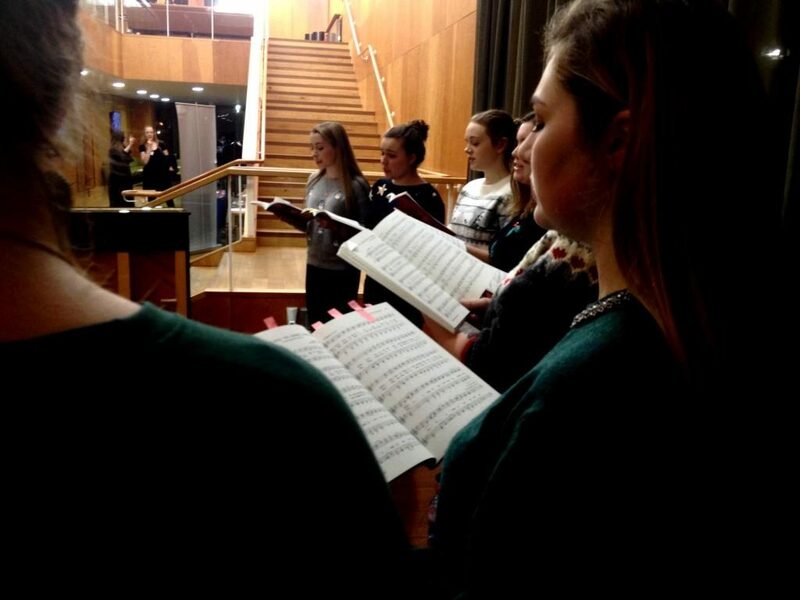 There’s something particularly magical about hearing traditional carols in arrangements for sopranos and altos, an extra glimmer of frosted sparkle adorning customary repertoire. 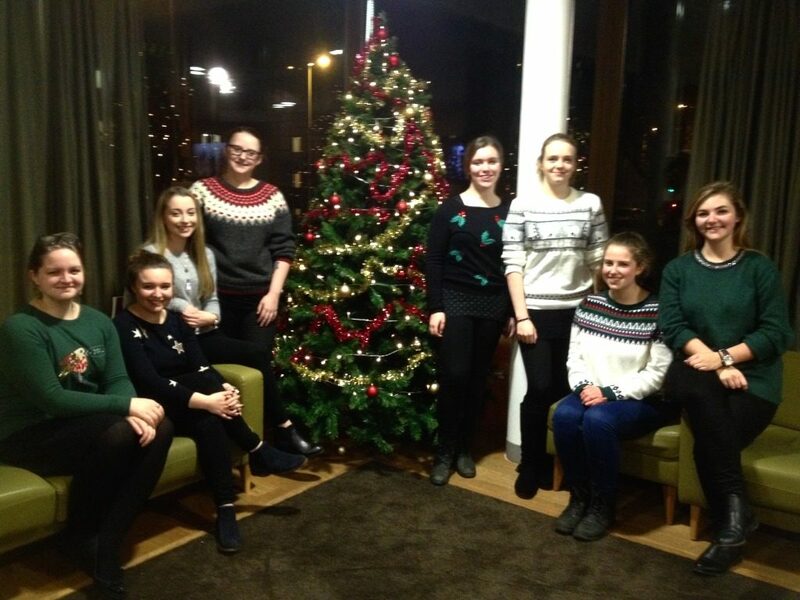 Our first sprinkling of Christmas music in Colyer-Fergusson added a touch of the festive spirit to the reception, and there was a call for a group photo round the departmental Christmas tree afterwards. 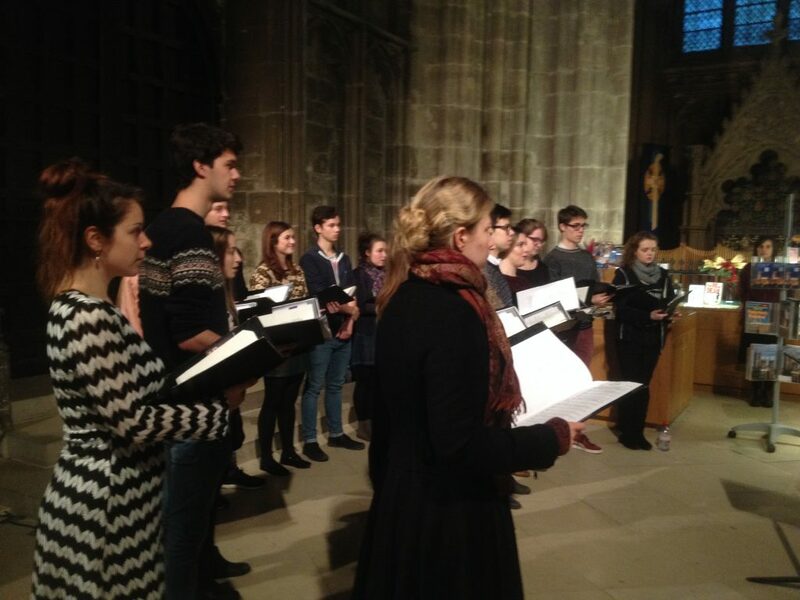 Next up, the Chamber Choir will be singing in the University Carol Service in the Cathedral next week. 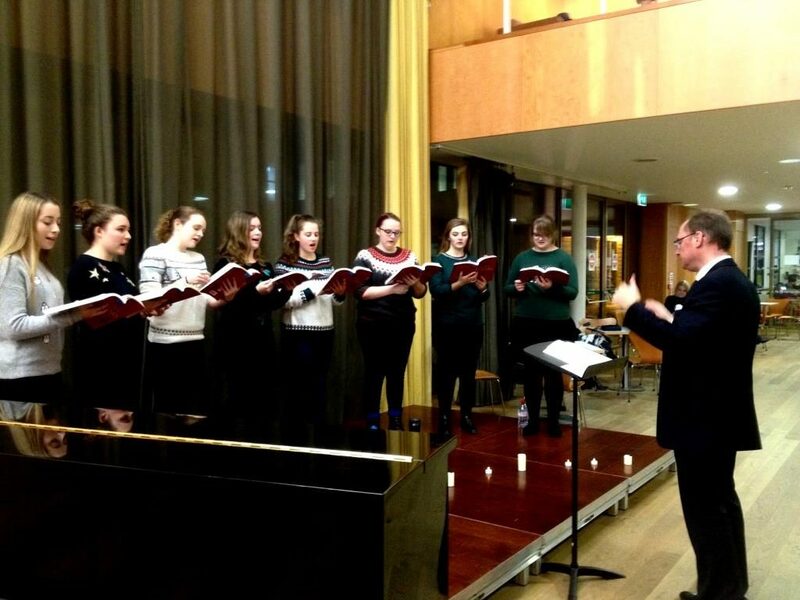 Thanks to Minerva Voices for getting Christmas underway! 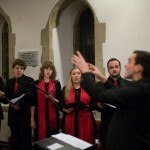 This entry was posted in Concerted effort and tagged carols, Christmas, donor, Minerva Voices, reception on December 5, 2016 by Daniel Harding. 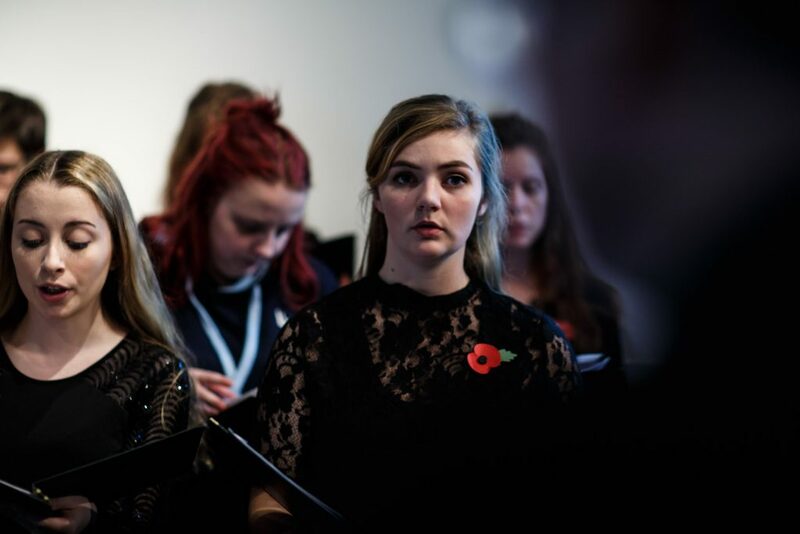 Thank you to all the members of the University Cecilian Choir and other performers, who took part in Memorial Ground by David Lang earlier today. 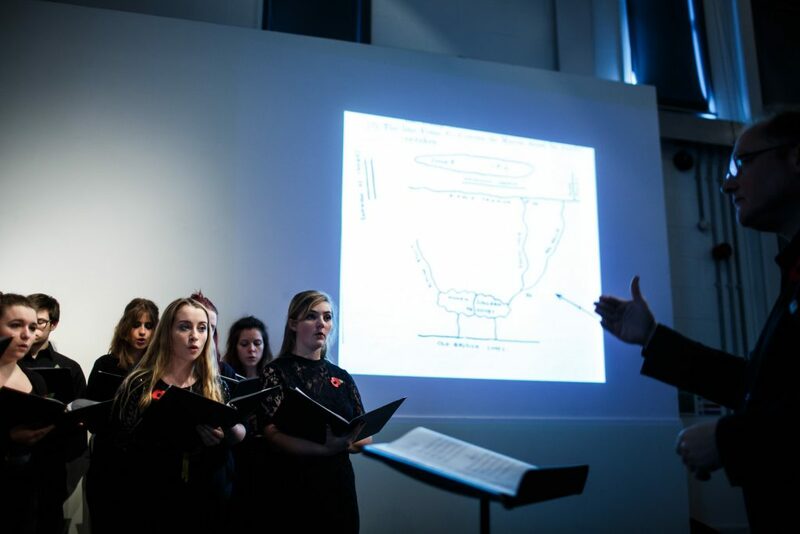 Combining music with poetry by Siegfried Sassoon, and a new poem by Nancy Gaffield, ‘The Turtle Dove,’ a member of the School of English, with archive image projection from the Special Collections and Archives, curated by Joanna Baines, David Lang’s haunting commemoration of the anniversary of the Battle of the Somme filled the resonant acoustic of Studio 3 Gallery, with percussion played by postgraduate Cory Adams. 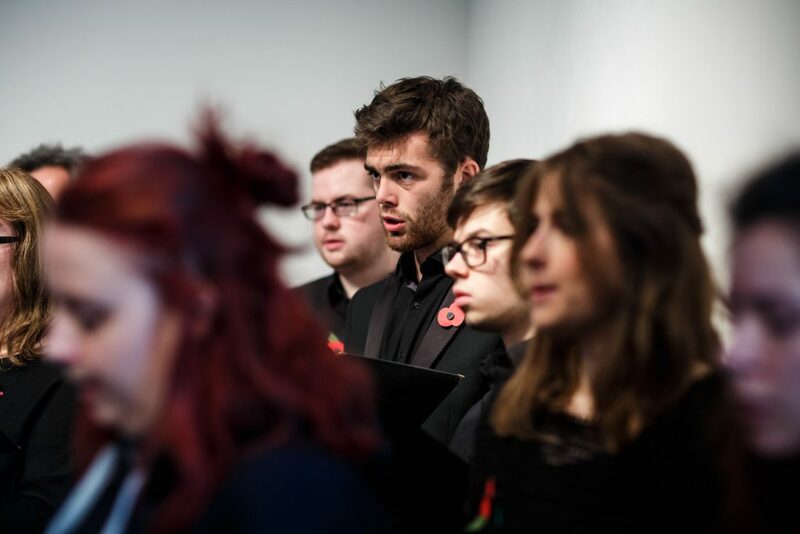 The sombre mood of the event was set by third-year trumpeter, Alex Reid, who prefaced the performance with ‘The Last Post.’ The readings were by James Cavalier, Masters student in Creative Writing. 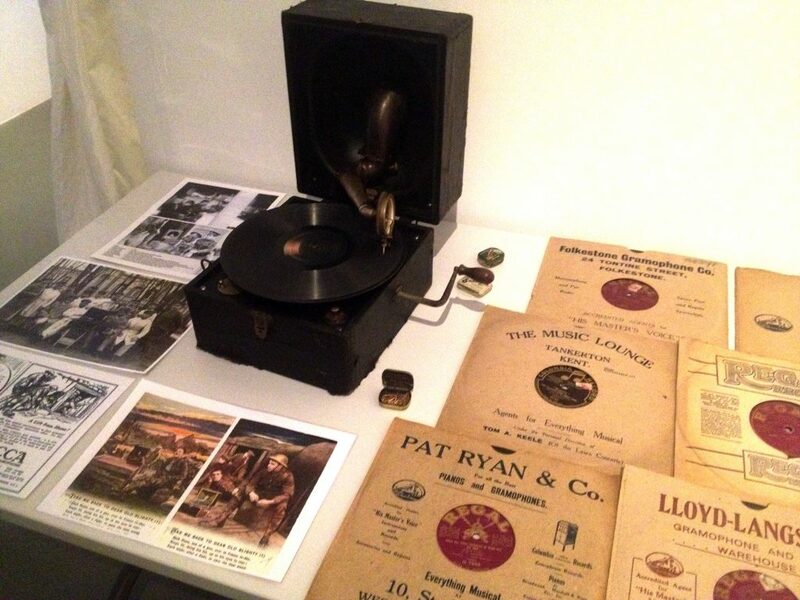 The arriving audience was greeted by the evocative sound of an original period portable phonograph playing records from the time, generously loaned for the occasion by Andrew Briggs, member of staff and also a member of the Choir. 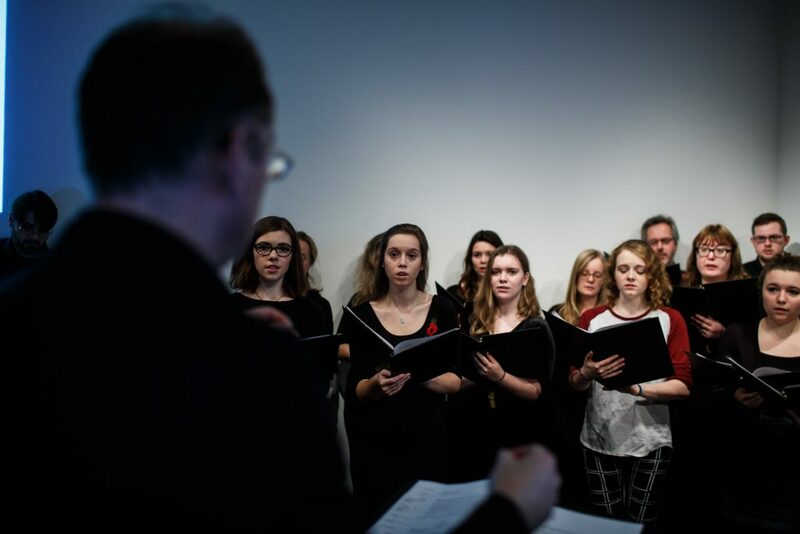 This entry was posted in Concerted effort and tagged Cecilian Choir, David Lang, Memorial Ground, music, poetry, Studio 3 Gallery, World War One on November 10, 2016 by Daniel Harding. 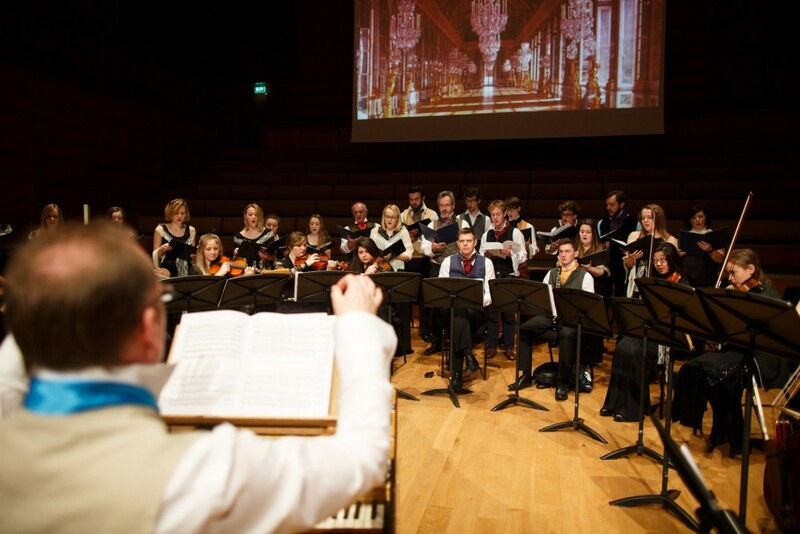 Thanks to Matt Wilson for these splendid images of the Cecilian Choir in concert earlier this week, in a concert celebrating the music of Jean-Baptiste Lully. 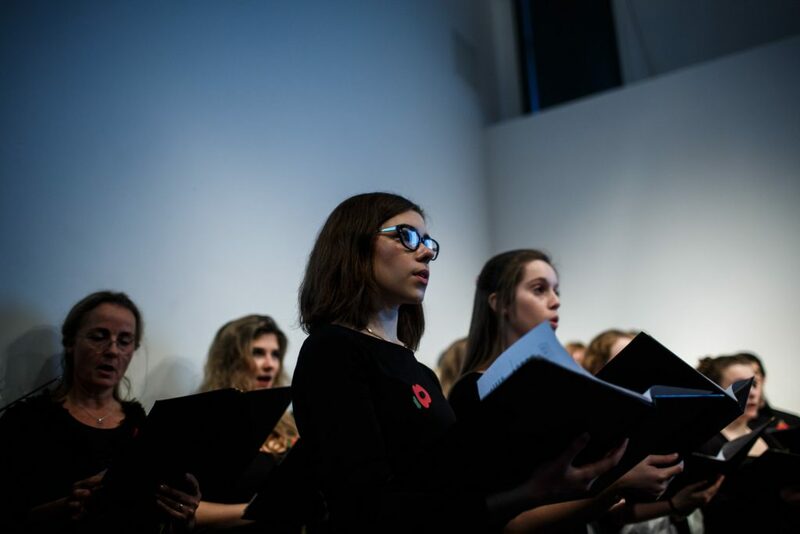 The Choir performed a selection of sacred and secular pieces in a programme that combined words, music, image and costume to offer a glimpse of the bygone age of the Sun King. 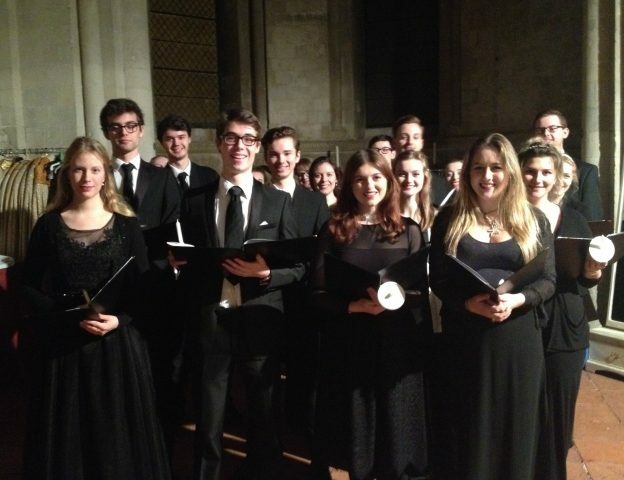 The Choir is in action once again in a dramatic programme for Easter at St Peter’s Methodist Church, Canterbury, when it will perform Vivaldi’s Credo and Magnificat on Thursday 31 March at 1.10pm. 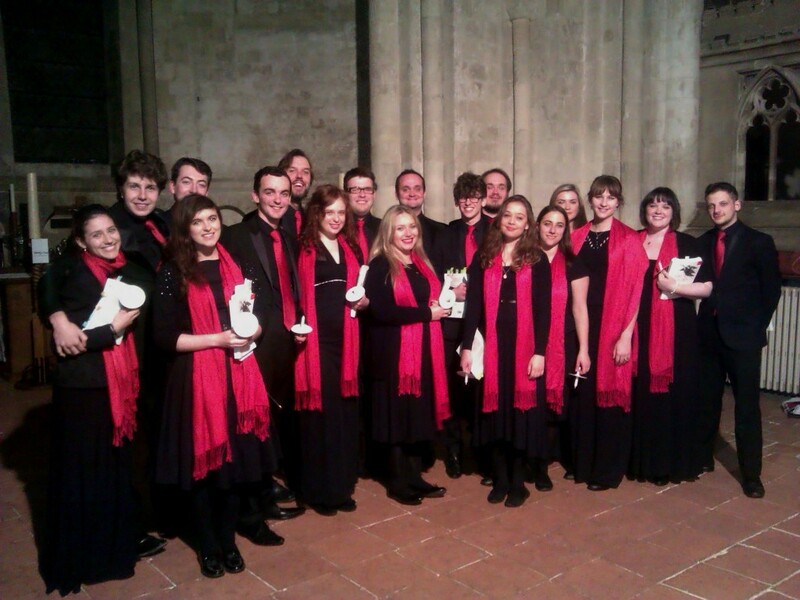 This entry was posted in Concerted effort and tagged Cecilian Choir, Lully on February 19, 2016 by Daniel Harding. 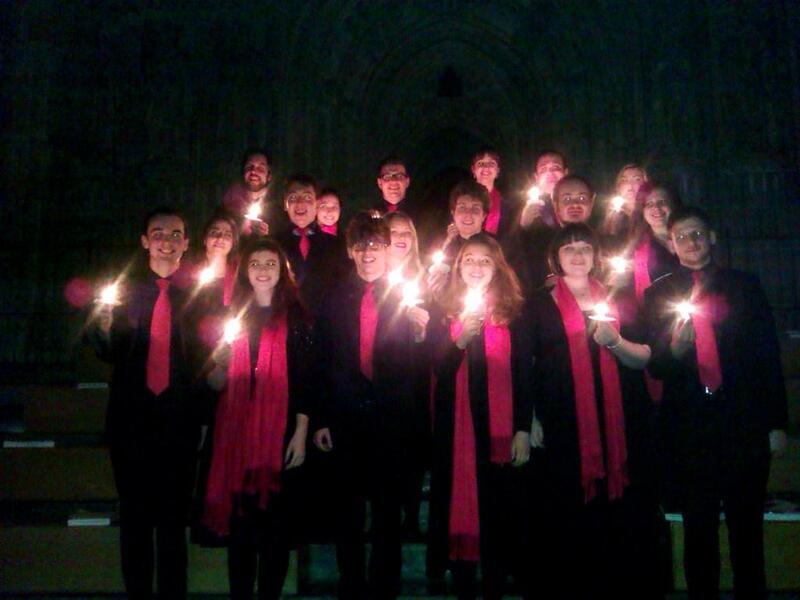 And so, the Chamber Choir’s first public concert has suddenly come and gone. 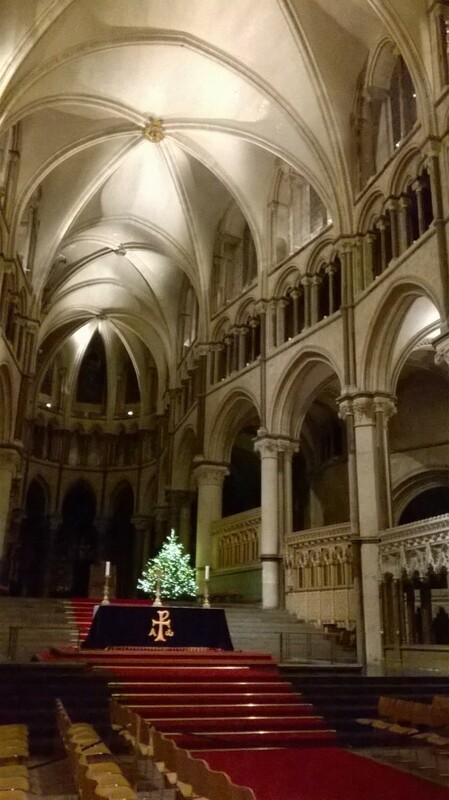 After all the preparation, the eager anticipation and excitement, the Advent sequence evaporated in a whiff of Christmas spice. 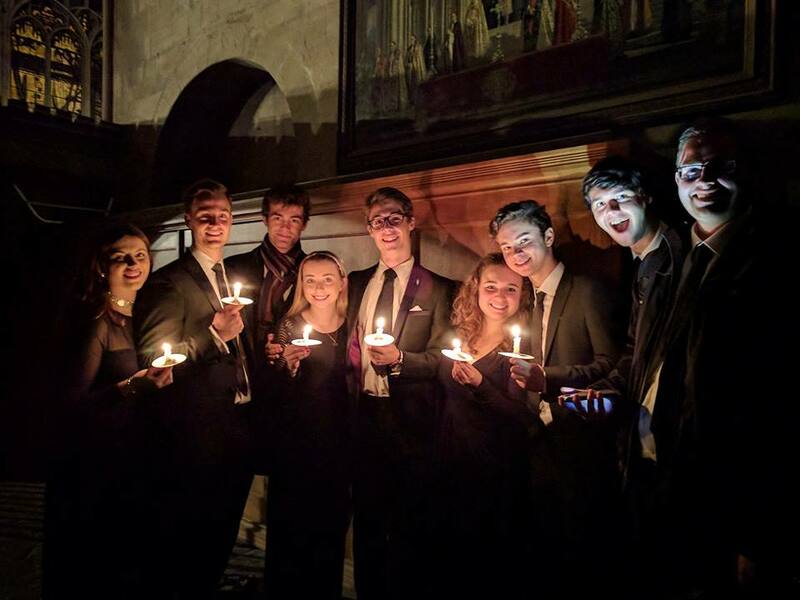 With the first unfolding of the Advent antiphon into the church of St Damian and St Cosmus at Blean, we well and truly ushered in the season of Advent. 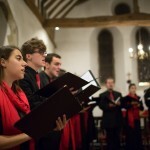 Carols, readings, poems, ancient plainsong – all combined to bring about a time to contemplate different aspects of this period of the year. 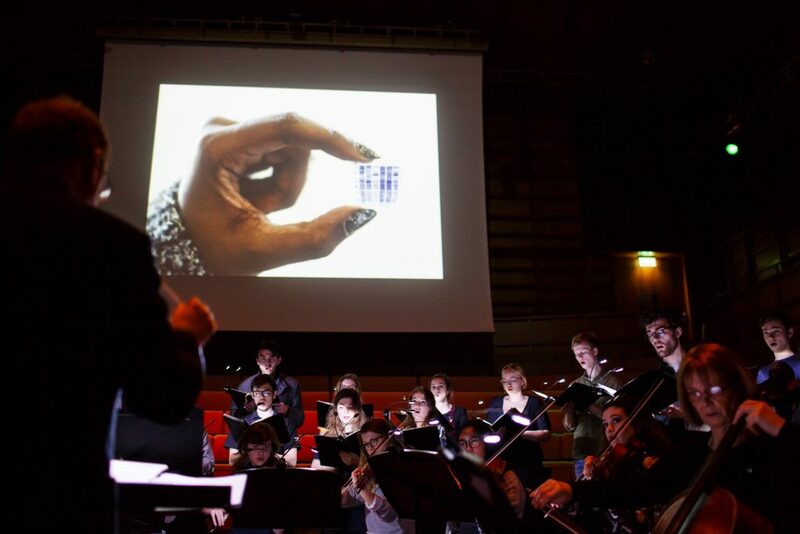 Because, after all, that’s what concerts do; they create a defined moment out of the humdrum of normal routine, away from the daily concerns of life, and offer a chance to experience time-out-of-time. 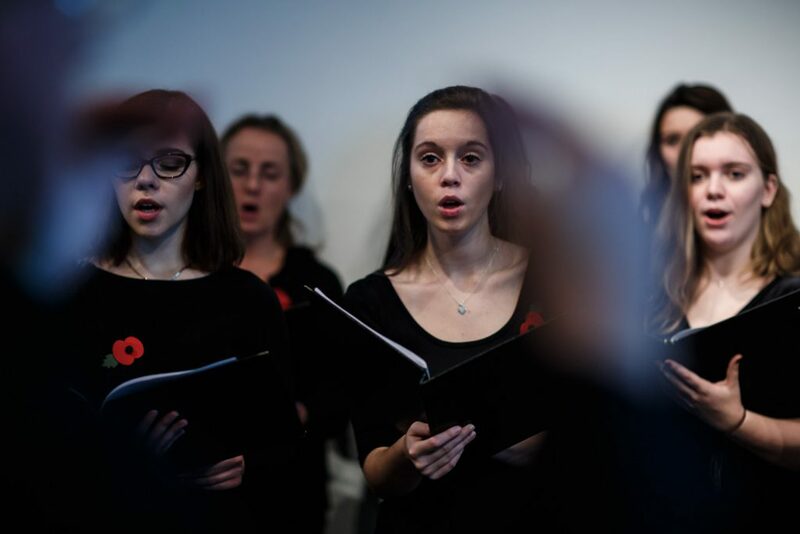 For a brief moment, time is governed not by the remorseless ticking of the clock or by timetables, schedules and commitments; instead, time is dictated by the crotchet pulse of a carol, or the lithe agility of a piece of plainchant, or in the measured metre of a piece of poetry. 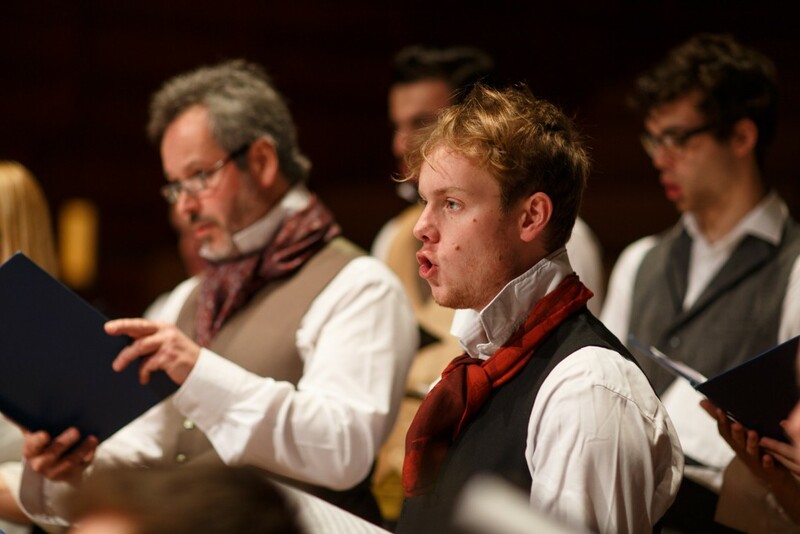 After the concert, there was a definite sense of achievement, of pride in what we’d achieved; it’s a big step between all the rehearsal preparation to delivery in performance, and nothing can quite prepare an ensemble for that crucible of performing in public. 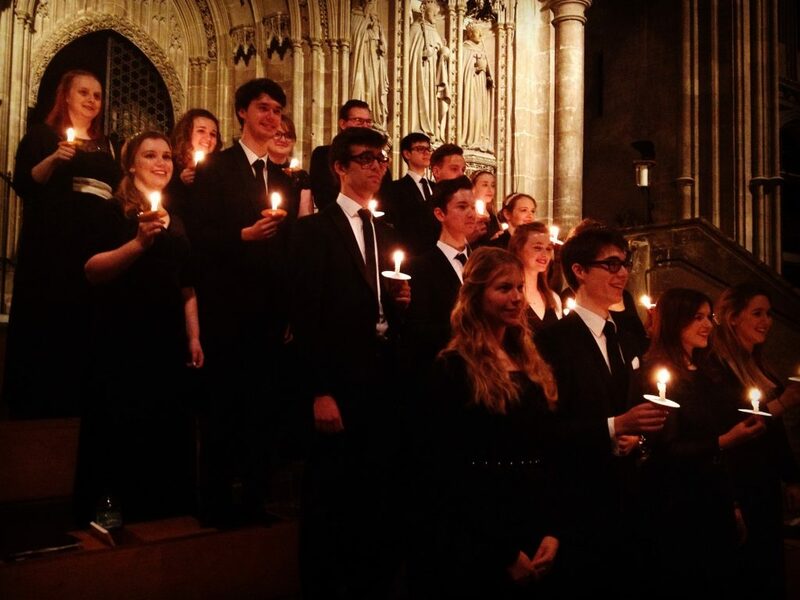 Our next commitment is in Canterbury Cathedral on Monday, for the University Carol Service, towards which we are all looking forward. 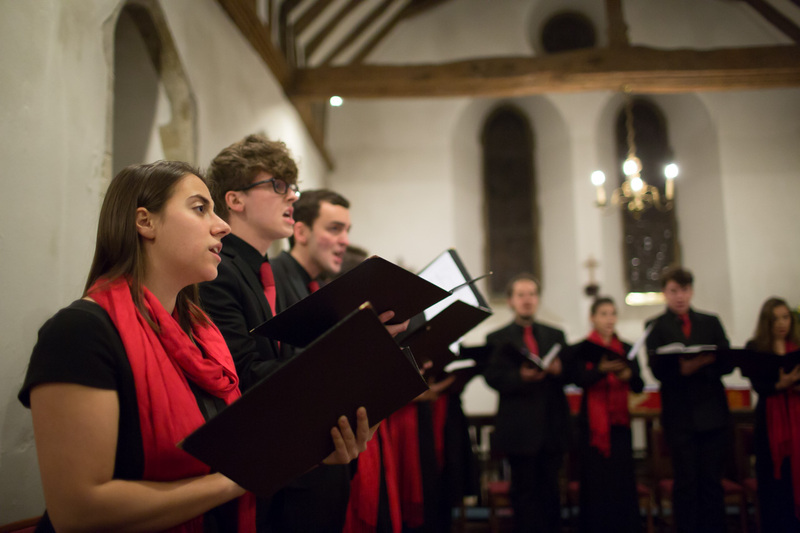 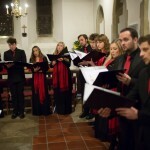 This entry was posted in Concerted effort and tagged Advent, Blean, carols, Chamber Choir on December 5, 2013 by Daniel Harding.